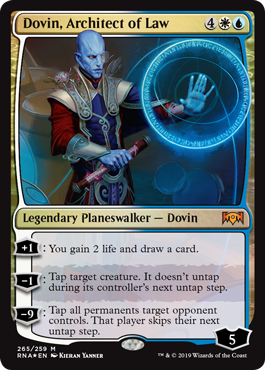 This version of Dovin presents an extremely tantalizing prospect for control decks: a one-sided Howling Mine attached to some additional life points, which actually increases his loyalty count in the process. His mana cost is on the high side, but for the style of deck that likes the game to go long anyway, that’s not always a problem; and besides, it makes him come in at about the time of the game when a control deck might be running out of answers. His -1 theoretically protects him, too, although it’s obviously less strong against swarms than against single large attackers. In both cases, timing is important. He can’t really turn a game around single-handedly, but he can help push the scales in your balance if you already have a chance of stabilizing. I almost hesitate to mention that if you like combining black- and silver-bordered cards, his ultimate is a one-sided Stasis lock in combination with Magical Hacker. For everyone’s sake, please don’t do that. As with the previously-reviewed Domri, this Dovin is not meant to be a Constructed staple. That said, this Dovin is quite a bit better than that Domri was, particularly insofar as having a home. In particular, Dovin provides a steady stream of advantage in cards and life, with the ability to ice a troublesome creature for a bit if need be. His ultimate can be back-breaking to take an opponent out of the game for a turn, which can be enough to smash their entire army. It doesn’t guarantee a win, but it’s definitely a lot more potent than some ultimates. 5 loyalty makes for a nice buffer, even if it changes pretty slowly. Bad Dovin is perfectly passable, especially if you’re already in a control shell. But there’s nothing really unique to him outside of his ultimate (and even that isn’t completely new…right, Yosei? ).